We wear pink ribbons. We walk or run for the cause. We have a month for awareness, and yet many women who have a higher risk variant in the BRCA1 or BRCA2 genes remain unaware of their heightened genetic risk for breast and ovarian cancer until a doctor diagnoses them with cancer. This is not a radical indictment of the American healthcare system; it’s just a fact. We are very good at treating illnesses, but not at preventing them. Today, 23andMe received the first-ever FDA authorization for a direct-to-consumer genetic test for cancer risk for its BRCA1/BRCA2 (Selected Variants) report. The report covers three variants in the BRCA1 and BRCA2 genes associated with increased risk for breast, ovarian, and prostate cancer. These variants are most common in people of Ashkenazi Jewish descent. Worrying about the many current 23andMe customers who have one of or more of these variants has caused me sleepless nights. We believe they have the right to know about this risk, if they choose. And it’s more than just women — men with one of the BRCA1 or BRCA2 variants we test for are at higher risk for male breast cancer, and may have a higher risk of certain other cancers as well. Men who find out they have one of the tested BRCA variants can also alert female relatives who might benefit from knowing about their potential genetic risk. A 2014 study led by Dr. King found that 50 percent of families that had a BRCA1 or BRCA2 mutations had no history of breast or ovarian cancer that would have triggered clinical attention. Similarly our own data shows that a significant number of 23andMe customers who have one of the selected BRCA mutations for which we test, would likely not meet traditional guidelines for screening because they reported being unaware of their ancestry or a family history of cancer. Those customers — carriers of the selected BRCA1/BRCA2 variants who reported no family history of cancer and no Jewish ancestry — would likely never know about their risk because they’d never be offered screening under traditional guidelines. It’s a small but significant number of people, and for those individuals, this information could have a profound impact in their lives. A few years ago, 23andMe studied how people react to unexpected BRCA findings. Researchers found that the results didn’t induce anxiety, which was the concern of many. Instead, they sparked crucial conversations among families. These conversations, in turn, created what researchers call a “cascade effect” — benefits that extend beyond the person who tested, to members of that person’s family, giving each a warning of a potential risk not just for breast, but also ovarian as well as prostate cancer in men. This was a small study, but since the paper was published a lot has happened. 23andMe had to suspend offering genetic health risk reports — including the BRCA1/BRCA2 report — to customers as we went through an FDA review of our ability accurately detect these variants, and report genetic health risk information to customers in a way that could be easily understood. We did that. Let’s be clear, 23andMe’s new report, once it’s available, does not diagnose cancer and cannot rule out your chances of getting cancer. It doesn’t cover most of the thousands of BRCA1 and BRCA2 variants associated with increased cancer risk, variants in other genes associated with hereditary cancer, or non-genetic factors such as environment and lifestyle. It should not be used on its own to make medical decisions. Results should be confirmed with a healthcare provider in a clinical setting before taking any medical action. 23andMe’s BRCA1/BRCA2 report is not going to be helpful for everyone, but it’s a step in the right direction. We already know of customers who benefited from this information. I know some of these women. 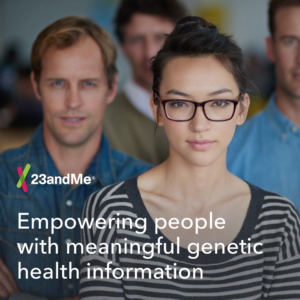 They are among the 23andMe customers who tested more than four years ago when we previously offered this report. Women like Hilary Hood, a photographer, and mother of three grown daughters, who was surprised to learn about her breast cancer risk after testing with 23andMe. It was a shock for Ann Mellinger too. Ann, a CEO, and mother in New York didn’t have information about her biological father’s family health history. She didn’t know about her Ashkenazi ancestry, heritage that traces back to Jewish communities of Eastern Europe. Now, more than four years later, with our third FDA authorization we can again offer a BRCA report to customers covering the selected BRCA1/BRCA2 variants. It’s the first time the Agency has authorized a direct-to-consumer genetic test for cancer risk without a prescription. This is a major milestone for 23andMe, but more importantly, a significant step forward for consumers who want direct and affordable access to their health information. Over the last four years, it has kept me up at night knowing that we have customers with one of these risk variants but have been unable to tell them. I can sleep better knowing that soon, if our customers choose to, they can view this information. We know from our own data that this information can be incredibly meaningful for customers and, in some cases, could even save lives. Statistics come from internal data of 23andMe customers. 23andMe’s research team is working on a manuscript focusing on this data. Francke, U et al. (2013). “Dealing with the unexpected: consumer responses to direct-access BRCA mutation testing” PeerJ 2013.